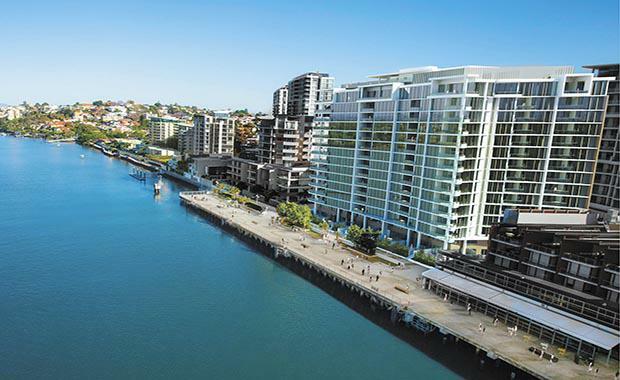 Pinnacle at Portside Wharf, as one bedroom apartments have already sold out. Sales have now reached more than $80 million. Apartments start from $595,000. Two and three bedroom apartments, River Terraces and one penthouse remain for sale. Construction reaches the fourteenth level of the luxury riverfront apartment building, with the remainder of the 15-storey building set for completion early next year. "The majority of our buyers have come from within five kilometres of Portside Wharf and are looking for a low maintenance alternative to the family home,” says Brookfield Residential Properties Regional Director Lee Butterworth. Coco Republic Interior Design, senior interior designer Polly Gillman said the display had been designed in-line with the riverside lifestyle on offer in the sophisticated Portside Wharf precinct. "The apartment has a captivating riverfront location and stunning city views so we wanted to create a contemporary space with classic highlights that would complement this," she said. "To emphasise the serene, natural landscape, a neutral colour palette has been used with accessories introduced to add splashes of colour. "The styling is clean and minimalistic to retain a contemporary feel that let the views remain the hero." Apartments will be have high quality finishes with floor to ceiling windows, stone benchtops and European appliances. "Pinnacle will be Portside Wharf's premier apartment building with an absolute riverfront position, giving many apartments stunning river and city views," Mr Butterworth said. Residents will have access to a rooftop infinity pool, barbeque and entertainment area, gymnasium, onsite security and secure car parking.